Minimally styled clock screen savers are fairly popular and we’ve shared a variety of them here before, but it’s hard to get more minimal than a binary clock. The aptly named BinaryClock is just that, a free and simple binary clock screen saver for OS X that has some nice color effects that change with the time. Binary clocks are also fun because the average person may look at it with utter confusion, while you’ll be able to read the time (and don’t worry, if you don’t know how to read binary clocks, we explain it simply below). To install the quartz file as a screen saver, download the “BinaryClock.qtz” file from GitHub and save it to ~/Downloads or the desktop. Now launch System Preferences from the  Apple menu and choose Desktop & Screen Saver. Locate the BinaryClock.qtz file and then drag and drop it into the preview pane of the Screen Saver preference panel to install it. Alternatively, but perhaps better for most advanced users, you can just toss the .qtz file into ~/Library/Screen Savers/ to install it manually. BinaryClock has a few configuration options regarding the screen savers color schemes, and you can choose to hide or show the numbers on the clock itself. Speaking of showing numbers, if you’re new to reading binary clocks it’s best to keep them shown until you get the hang of reading the time. How Do I Read a Binary Clock Anyway? Though it may look foreign, it’s actually easier to read than you may think at first glance. This screen saver makes it even more simple because it doesn’t include the time in seconds as well, but the basic idea is just a matter of adding the highlighted numbers in the top row to get the hour, and adding the highlighted numbers in the bottom row to get the minutes. The screenshot below demonstrates this with the numbers shown, and once you remember the positions of the numbers you can hide them and the method remains the same. You’ll find that not all binary clocks are positioned exactly the same way, but the method of telling the time is the same whether the numbers are shown in columns or rows. 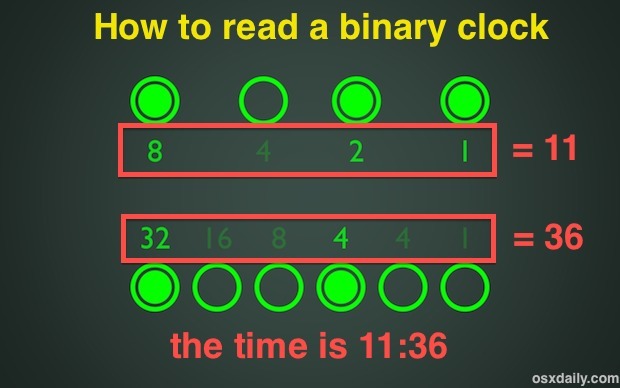 Update: Right after publishing this, we discovered a minor albeit important typo in the BinaryClock screen saver, where in the minutes the 4 is duplicated twice, the 2nd of which should be the number 2. Basically, if you show the numbers but don’t correct that in your head, then the time will be off by two minutes. Presumably that bug will be fixed by the developer quickly, but anyone with knowledge of Quartz Composer can also do it themselves easily. Update 2: The aforementioned typo has been fixed, that was quick! I like it, but the last 4 should be 2. The typo was removed, thanks for your help and for this article ! Thanks for making a great screen saver! The developer has already fixed it. That was quick! IMHO, this is a silly idea because telling time should be instant, requiring no translation. This is just lacking in common sense. With the explanation to me it would make sense being a westerner the digits read left to right?? 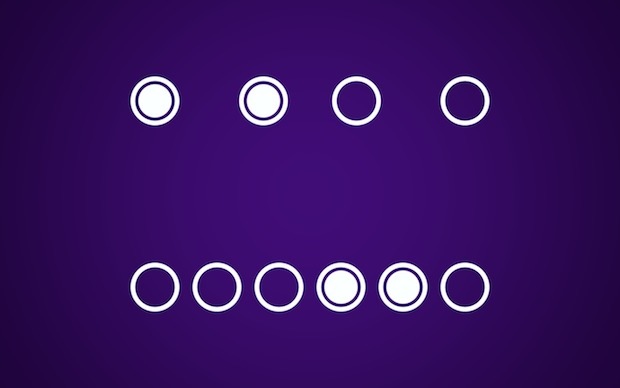 Do you realize number always go from right to left? A number like 3217 also goes from right to left, not from left to right. The smallest number is 7 and it’s located on the far right, while the largest number is 3000 and it’s located on the far left. So in the top screenshot is the time 12:06? Look, that’s a real binary clocks. I love binary clocks and would love to buy a binary clock to use in my living room, but unfortunately binary clocks you can buy on the internet are only half binary. First column: first LED lid. Second column: second LED lid. Third column: no LEDs lid. Fourth column: second and third LEDs lid. That’s no real binary clock. That’s only half binary. Those clocks should display the time like this screensaver does. That’s a real binary clock. It would be nice if someone made a wall clock which displays the time, just like this screensaver does. I’ll stick with an analog clock. It is a “gestalt” device. I just get Quartz Composer text on my screensaver. It’s strange because it works fine on my MBA under MacOS 10.8.2. Do you using the .qtz or the .saver ? Thanks for a great screensaver! I like it a lot! However, the hours are incorrect. It is currently 17:40 (That’s 5:40 PM for the militarily challenged), and it is showing 9:40. I would bet that if I changed my time to display 12 hour instead of 24 hour, it would work correctly. Yep, it changed to 5:47 by the time I got it done. Too bad. I use 24 hour time.